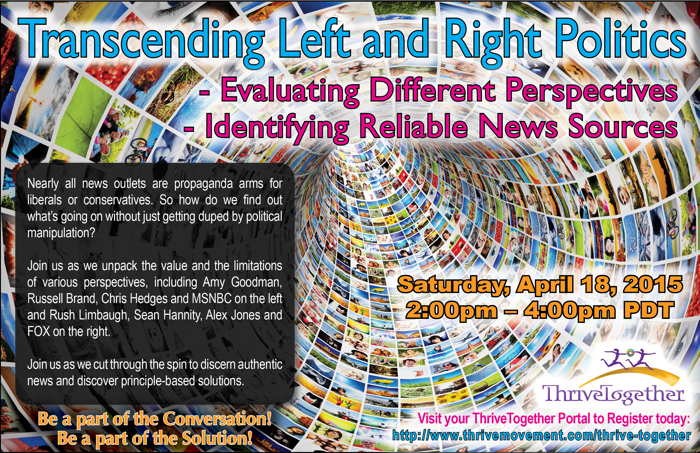 From Amy Goodman, Russell Brand, Chris Hedges, The Nation magazine and MSNBC on the left … to Rush Limbaugh, Sean Hannity, Alex Jones, Foreign Affairs magazine and FOX on the right, Foster and Kimberly unpack the value and the limitations of each of these perspectives as we cut through the spin and ideologies to discern authentic news and discover real solutions. Both left and right politics have always led to tyranny, be it communist, socialist, democratic or fascist. And nearly all news outlets are propaganda arms for liberals or conservatives. So how do we find out what’s going on without just getting duped by political manipulation? Where do we get our news? In a world of information overload, how do we uncover truth and take action based on principles rather than politics? When we made THRIVE we had two fact-checkers who spent months verifying claims we made in the film. The result is that no one has been able to disprove assertions that we made. But without resident fact-checkers, how can we be sure we are not confusing fact for speculation? How can we be sure we don’t just recognize information that confirms something we already believe and miss evidence that challenges our worldview? Be a part of the conversation. Be a part of the Solution. Imagine that the bounty of human connection and planetary healing that once seemed impossible is now manifest everywhere…That what began as a quiet rumble of dissatisfaction turned into a transformative rush of creativity…And imagine that each and every one of us was instrumental in having this be so…Imagine the quiet inner discomfort we have each experienced as separation from one another no longer binds us, and instead we realize that we are not nearly so alone as we had been led to believe. Imagine we learn to listen differently…to tune into people who think differently, to listen for what we share as values, and explore skillfully how we might each have something to offer. Imagine that we no longer want to waste our time confused about which compromise of our morality is better when no compromise is needed…We recognize that like Dorothy in the Wizard of Oz, we have been wearing the red slippers all along…that the angst in our hearts was the sign that we are in fact meant to be true to ourselves and no one has or will ever have the right to take that from us. Imagine feeling secure enough that when people offer accurate accounts of our history we are empowered to find our own part in seeing that it never happens again, and we turn away from the false stories, the false choices, the sources of manipulated news that leave us afraid of one another and disconnected from ourselves and instead we insist on something different, something that expands our world views, includes more perspectives, empowers us to know and believe in ourselves and unleashes the creativity that is our true birthright. Imagine we share honestly about the power and clarity we feel when we stop violating ourselves in the name of what is expected of us… Imagine — Like waking up from a long, disturbing dream, we gradually re-inhabit our true selves, and we are no longer afraid, not afraid of the inner calling that we had been trained to suppress, not afraid of each other. We forgive ourselves for having fallen prey to a distorted reality. And we forgive each other. We know that no one can take our purpose from us, and with that confidence we find that listening to another perspective becomes interesting instead of threatening. Imagine at the next family gathering, instead of avoiding the person whose world view is most different from yours, you decide to ask him what he most values in his own life, and somewhere in that conversation you discover that you both want similar things…that almost all of us want similar things…And an expanded understanding emerges. Imagine we no longer allow our own biases to prevent us from knowing each other. Imagine, the old news falls away from atrophy, from people no longer buying it, and new sources emerge that reflect an ever-expanding sense of how many people share common values, and an ever-expanding appreciation for the different ways people have to manifest them. Imagine you feel energized in your body, challenged in your mind, excited emotionally and connected with practical skills offered to help navigate our differences respectfully. Imagine open source news that people everywhere feed in to — with robust, collaborative, multi-generational, cross-cultural, discussions. Imagine news reports that explore true solution strategies that offer real ways out, so that those once in need of help become the helpers, and each subsequent generation needs to spend less time healing and can instead spend more time creating. Imagine that when you tune in you can be assured that you will feel more alive, more capable of engaging in a way that calls forth the best of who you are, and the best of what you are here to do. Imagine the most constricted time in human evolution gives way to the most expansive, where boundless creativity launches humanity into an unprecedented clean-up empowered by our knowing that we can do this — that in fact, we are already doing this.